The Penrose Triangle is as elegant as it is impossible—much like M.C. Escher’s drawings, it presents a two-dimensional illusion that the eye interprets as three-dimensional. The task of effectively creating this illusion in three dimensions, without resorting to hidden openings or gimmicky twists, seemed daunting until a Netherlands-based designer named Ulrich Schwanitz succeeded in printing the object recently. But Schwanitz, who posted a YouTube video of his design achievement in action, wouldn’t share his secret with the world. Instead, he made his “impossible triangle” available for purchase through Shapeways, a company that fabricates custom 3D designs, for $70. Within weeks of Schwanitz’s “discovery,” however, a 3D modeler (and former Shapeways intern) named Artur Tchoukanov watched the video and figured out how to recreate the shape. 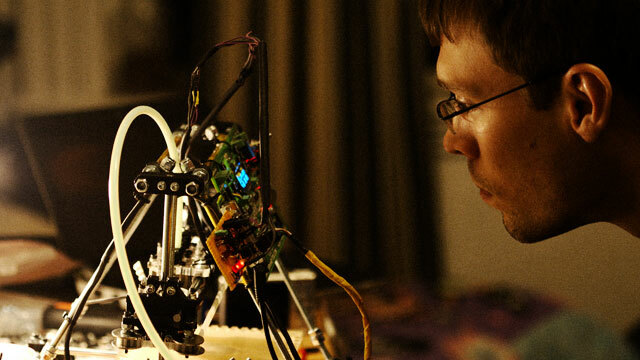 He then uploaded instructions to Thingiverse, an open-source repository of 3D models and content. BoingBoing picked up the story (well, part of it), and “wrongly” credited Tchoukanov as the initial creator of the object. The same day the story ran, Schwanitz sent Thingiverse a DMCA takedown notice and demanded that the site remove Tchoukanov’s design (and a related one) because it allegedly infringed Schwanitz’s copyright. Although the copyright claim was questionable at best—was Schwanitz asserting copyright in the 3D design file, the image, or the structure itself?—Thingiverse nevertheless complied with the notice and removed the offending designs. Schwanitz’s DMCA takedown notice was indeed a milestone for Thingiverse, which had operated free of any public accusations of patent or copyright infringement since it was founded. As a result of the incident, Thingiverse updated its legal page with DMCA language. But the complaint spoke to something broader, and far more significant for 3D printing as a new technology: Schwanitz’s takedown was the first shot in the next theater of the intellectual property (IP) wars. It was also the first formal attempt to apply copyright law to regulate content on a 3D printing repository of any kind. While Ars readers have enjoyed great coverage of 3D printing-related topics, the general public still isn’t familiar with the technology. Indeed, many of my legal colleagues were baffled as I explained how any physical object can now be scanned to generate a CAD (computer-aided design) file and later recreated—anywhere, anytime—using a 3D printer. All agreed that such a technology would have unprecedented implications for intellectual property law (and vice versa). As with all technology, as 3D printing becomes simpler, more powerful, and more common, it will catch the eyes of more lawyers, regulators, and, of course, individual designers like Ulrich Schwanitz. And that will mean conflict. Here’s a primer on some of the key legal issues that will frame the upcoming battles. Though still in its infancy, personal 3D printing technology already shows the same disruptive potential as the original printing press. Just as moveable type spread across Europe and democratized knowledge, the proliferation of 3D printers eventually promises to democratize creation. Broken dishwasher part? Download the relevant CAD file and print it out in plastic. While Amazon made trips to the store seem dated, 3D printing will make ordering (some) things online feel positively quaint. Most people think of “printing” as a strictly 2D affair, but 3D printing works much like its 2D cousin, the inkjet printer, though it builds up a succession of layers to form its objects. Such printers can cost between thousands and hundreds of thousands of dollars (a build-it-yourself model, the RepRap, can be assembled for a few hundred bucks). The fabrication process begins with a 3D design file, created from scratch or drawn from a 3D scan of an object. Software deconstructs the 3D image into a series of 2D cross-sectional slices and the printer deposits layers of material, typically plastic or metal, one atop the other in the shape of each 2D slice. The layers are fused, and the fabricated object is treated and hardened. Because 3D printers don’t need to carve material from preexisting blocks (as in sculpture), the process allows for elaborate and visually stunning shapes to be created in a matter of hours with no manual labor. The size of these shapes is only limited by the size of the printer making them—heck, combine a big enough one with a space probe and you’re halfway to Von Neumann technology. All that is well and good, but as Thingiverse recently discovered, any technology that allows users to digitize and replicate objects is bound to have some IP implications. And it’s precisely because of its potential as a game changer that 3D printing presents challenging legal questions best addressed before the technology becomes ubiquitous. Gutenberg didn’t have to worry much about intellectual property laws, but he had to compete with an array of other legal and societal challenges to his invention. Eventually copyright, a novel concept in the 16th century, emerged as a means to regulate Gutenberg’s disruptive technology. 3D printing is especially intriguing from a legal perspective because, like the printing press, it has broad implications for the existing legal regime (including all three areas of IP – patent, copyright, and trademark), but it also presents issues that may warrant broad changes to existing law—or require new laws entirely. In discussing the topic with colleagues and reviewing the state of the law, I found that few people have spoken up on how the law will influence 3D printing. How has so disruptive a technology remained in the legal shadows? First, the promise of one day making anything, anytime, out of almost any material is so broad that no one knows—or can really know—exactly how that technology will affect them. P2P software and websites that became flush with copyrighted media quickly drew the ire of studios who were directly being harmed. But artists, designers, and inventors alike may take a wait-and-see approach until 3D printing technology directly affects them, just as Schwanitz did. Second, 3D printing today remains a hobbyist-driven enterprise with a high barrier to entry. Some readers may recall that it wasn’t until Sony began advertising an affordable Beta-format VCR in 1975 that Hollywood studios took notice of home video recording and famously decided to file suit against Sony. Trying to regulate a technology that’s not yet ready for prime time may simply be premature for lawmakers and lobbyists alike. Lastly, there hasn’t been a truly high-profile allegation of infringement against or within the 3D printing community. Napster operated freely until Metallica complained of finding a demo circulating on the user network, a discovery that spawned a cavalcade of other aggrieved musicians. The 3D printing community, animated as it is by an open source esprit de corps, simply hasn’t had a defining “Napster moment” yet. If the current 3D printing free-for-all sounds too good to last, it is. The community today is small and has avoided, either by chance or design, stepping on any really big toes (sorry, Ulrich). But to see why the hammer will fall eventually, consider the existing 3D object hosting sites. Two models have emerged for websites that distribute and/or fabricate 3D designs. In the first model, users freely upload, improve upon, and distribute virtually any designs at all. This “open model” is typified by Thingiverse, where users share designs under Creative Commons licenses. The second type of website, which we might call a “money model,” commercializes aspects of the 3D printing process. Sites like Shapeways, where you can order custom designs for everything from jewelry to “impossible triangles,” have embraced this approach. Other “money model” sites will even sell 3D designs for highly distinctive designer items. These sites will no doubt proliferate as 3D printers become more common, and they will seek to capitalize on the legal uncertainty associated with distributing 3D design files for copyrighted and/or patented items. While each model embraces a different view of the future of 3D printing, all are likely to face some of the same fundamental legal challenges. Sites that distribute protected content, whether they do so out of (non-commercial) enthusiasm for the technology, or out of the desire for revenue, always make better targets for rightsholders than the users of those sites, so websites like Thingiverse and Shapeways are likely to be first in the crosshairs. While those two sites in particular have been well-behaved from an IP perspective, rightsholders looking for targets today needn’t go too far to find them. It’s unlikely that a legitimate rightsholder would refrain from suing Thingiverse simply because it advocates an open source, non-commercial approach to sharing 3D designs. But so far, the site has only acknowledged one IP-related complaint, that of Ulrich Schwanitz. This is curious, as Thingiverse’s collection boasts designs for things like companion cubes (Portal), and Darth Vader heads (Star Wars). Thingiverse also hosts design files for the hexagonal tiles and game pieces used in the popular Settlers of Catan. Distributing any of these files could put Thingiverse on the receiving end of a more forceful DMCA notice (or a cease & desist letter) than Schwanitz’s. After all, these are lucrative, million (and in the case of Star Wars, billion) dollar intellectual properties. So what gives? But Valve, Lucas, and the publishers of the Settlers of Catan series may be taking some risk by letting these designs slide. While the 3D designs hosted on Thingiverse seem directed toward a very small hobbyist community, if companies fail to police their IP rights, what would stop an overseas manufacturer from downloading the designs, mass producing knockoffs, and selling them through Amazon, eBay, or another storefront entirely? Of course, the designs could be procured elsewhere, but courts often look unfavorably on parties that sit on their rights. We already know that a purely philanthropic or non-profit purpose doesn’t usually shield a website from the weight of IP law enforcement. However, sites that overtly try to profit from or monetize others’ copyrighted works or patented inventions may more quickly attract attention, and lawsuits. Take for example, 3Docean, which allows users to buy designs for an Alessi tea set that retails for a few hundred dollars elsewhere. On another site, the3dstudio, users can download the model for a Jonathan Adler chair that retails for $700 at Neiman Marcus—quite a steal. But what if tens of thousands of people were downloading the Catan pieces, the Alessi tea sets, and the Adler chair designs and fabricating these items daily? What if you could print any designer chair, iconic jewelry, or antique car parts for a fraction of the actual price? And what happens as the tech improves and can print using more materials and colors? That’s the future lawmakers, inventors, and designers need to start thinking about, because it’s coming. They need to envision a not-too-far-off future where 3D printers are as common as inkjet printers and users trade 3D designs as fluidly as they exchange URLs. And they need to think about how to use the law to vindicate IP rights without stifling innovation. Patents protect both functional inventions (“utility patents”) and ornamental or decorative designs (“design patents”), so the 3D printing of a patented invention or article would constitute direct infringement. Thingiverse would likely be immune from a claim of direct infringement, as it merely hosts the 3D design files uploaded by its users. But it could be liable under a theory of indirect infringement (PDF). Anyone who, in the words of the Patent Act, “actively induc[es] another to infringe a patent” may find him or herself indirectly infringing and could also be liable for damages. This has real implications for both Thingiverse and Shapeways. Specifically, as the nature of 3D design files shifts from hobbyist items to popular and commercial ones, such websites will need to do more than passively assume uploaders comply with user agreements that pay lip service to IP laws. One smart and simple move in this direction would be the introduction of a “Flag” option on each product page—the appearance of a trade name or a specific item name (e.g., “Alessi,” “Jonathan Adler,” etc.) should set off some warning bells within the community, which could mark the item for investigation by staff. This isn’t to say that websites must run costly IP searches each time a file is added to their archive—just that in their current form, such websites invite being termed “weak on IP,” a label that’s been brandished with some success by both trial lawyers and lobbyists. More importantly, the 3D printing revolution should not get off on the wrong foot with rightsholders. The community has a unique opportunity to build synergistic bonds with artists, designers, inventors and companies of all kinds to jointly exploit 3D printing technology in new and lucrative ways, and to create a robust, collaborative community free of the acrimony we’ve seen in many recent IP disputes. It would be a shame if all that creative potential were squandered in a flurry of endless litigation. On the other hand, rightsholders should be careful not to be too heavy-handed, as engaging in extensive litigation early on may forestall easy opportunities to commercialize the technology and profit from decentralized distribution. The only patent litigation relating to 3D printing thus far has involved 3D printing companies. There have been no allegations of infringement relating to the use of a 3D printer to fabricate a patented object or device. This isn’t entirely unsurprising, as home 3D printing has yet to cross a certain “complexity threshold” which would allow replication of sophisticated inventions more likely to enjoy patent protection. But when commercially popular, sophisticated items are commonly printable, make no mistake, patentees will take notice. We’ve been discussing “utility” patents, but 3D printing also has strong implications for “design” patents, which protect the ornamental or decorative features of a product. Jonathan Adler’s chair would likely have been eligible for a design patent. Design patents are sometimes written off by practitioners because they are more limited in scope and comparatively easier to design around than utility patents; for those and other reasons, they can be challenging to enforce. But the advent of the 3D printing era may breathe new life into design patents and litigation surrounding them. Generally, to establish that a design patent is infringed, the patentee must prove that an ordinary observer, familiar with prior art designs, would be deceived into believing that the accused product is the same as the patented design. This inquiry presents a close question of fact that is highly susceptible to human error and simple misperception. In the case of a patent infringement claim based on a 3D-printed copy, however, the mathematical precision with which 3D printers fabricate items would go far to remove doubt from this traditionally fact-intensive infringement inquiry. After all, an aggrieved patentee could argue (assuming evidence existed to support such a claim) that the 3D design file was generated from a scan of the original, patented design, and the copy was fabricated with the same digital precision as an MP3 copy of a song. Courts would no doubt invite such clarity and juries could find it compelling, making patent litigation a highly desirable recourse when design patents are at issue. Although copyright is a different kind of beast from patent, it too will play a crucial role in the 3D printing world’s unfolding future. As we’ve seen over the past decade, copyright litigation offers rightsholders a powerful set of tools to combat infringement. Then again, those accused of copyright infringement have some potent tools of their own, like invoking the DMCA safe harbor, and the defenses of fair use and innocent infringement. Some people forget that an original creative work is copyrighted the moment it is fixed in a tangible medium of expression (i.e., not purely in the mind). Moreover, the degree of creativity needed for copyright has been described as “very slight.” While a clever haiku bouncing around your head is not copyrighted, type it in the comments and voila—it is instantly copyrighted (and hey, if Jay-Z uses it in his next hook, you may be entitled to damages!). Copyright registration isn’t required, but it’s important for establishing priority, ownership, and collecting damages. Copyright will come into play in a few important ways in the 3D printing context. First, and most simply, copyright protection is available for any object containing even a “slight” degree of creative expression—pottery, unique furniture, action figures, and industrial design pieces come to mind. Bear in mind that in the case of furniture and industrial design, two areas ripe for disruption by 3D printing technologies, the less utilitarian and the more expressive the design, the stronger the copyright protection. In the case of the Adler chair we discussed earlier, there’s no doubt that its “creative” part can be separated from its “functional” part. It may not be a Rothko, but it’s entitled copyright protection, and printing a copy would be infringement. Copyright is also implicated because the 3D design files themselves will be protected to the extent they represent original creative work (i.e., a design) in a fixed tangible medium of expression (i.e., a computer file). This is an issue that comes up frequently in the “stolen source code” context, where programmers assert their code was a copyrighted creative work (PDF). Downloading or sharing those files could constitute copyright infringement, although the strength of the protection for such files will turn on whether courts treat them more like blueprints than art. Generally, proving copyright infringement requires the copyright owner to show copying of the protected, i.e., original and expressive, elements of the work. This is easy when a duplicate object is fabricated, but perhaps more difficult when the only “copy” exists as a digital representation of a real object. That said, creating a 3D design file from a scan of a physical object may be considered unlawful “format shifting.” If a fancy chair can be represented in bits and sent to a friend, what’s to say it’s not a “copy” of the original? This argument takes on greater force if you believe that the design file serves little purpose beyond facilitating the fabrication of an identical chair. This is one area that lawmakers may eventually consider especially ripe for new regulation. By making this kind of “physical-to-digital” format shifting illegal under the auspices of copyright law, Congress would protect designers of all sorts of objects—from the humble dishwasher part to the ornate chair—and possibly give them a separate cause of action that courts could easily wrap their heads around. These considerations should cause lawmakers and the 3D printing community to look ahead to a time when the law may expressly forbid the very act of making 3D models from scans of real world objects for commercial purposes. Like patent and copyright, trademark is considered an intellectual property right. But unlike patent and copyright, trademark isn’t really about inventiveness or creativity (necessarily) – it’s about protecting consumers and making sure they can be confident that a product marked with a manufacturer’s symbol (or bearing a certain “trade dress” – a shape or styling) was actually made by that manufacturer. By selling downloadable 3D designs like “Jonathan Adler” chairs or “Alessi” tea sets, websites invoke the name and trademark of the original manufacturers and implicate trademark concerns that have nothing to do with the object made available for download. Just as if I brewed my own cola and called it “Coca Cola,” these sites could confuse consumers as to the provenance of the 3D files themselves. Imagine it’s the year 2050. You wake up groggily to the voice of your robot butler, who gently reminds you it’s your 30th anniversary. You’re dismayed to have forgotten (again), but not at all worried—while your car still doesn’t fly, you are the proud owner of a dishwasher-sized 3D printer in your kitchen that connects wirelessly to your home network. You hop onto Amazon, navigate an extensive selection of 3D files, and buy a Tiffany-licensed CAD file for a piece of jewelry she’s had her eye on. You choose your material (hopefully you’ve got some precious metal composite somewhere), hit print, and a few minutes later, your only concern is how to wrap the bracelet you just fabricated. But what if, instead of buying a licensed model on Amazon, you could simply download a torrent for the same bracelet? The current IP regime isn’t particularly well-suited for regulating that kind of activity, but if history is any guide, rightsholders will seek to apply traditional notions of copyright and patent against any party that makes infringing 3D designs available without authorization. So what are rightsholders to do? For starters, they should be careful of heavy-handed enforcement against sites like Thingiverse, which lack the resources to fight big legal battles on a shoestring budget. But rightsholders will want to be vigilant, particularly against “money model” sites that openly seek to commercialize the IP of others. Allowing those sites to develop, and perhaps even flourish alongside revolutionary and increasingly widespread technology, may instill a belief that their “stuff” ought to be much cheaper than it is. The most important thing at this early stage is dialogue. It’s clear that rightsholders have a formidable array of legal tools to go after both 3D printing hobbyists and the websites that provide 3D design files. Stepping on the wrong toes can diminish enthusiasm for one of the most promising technologies of this generation, discourage risk-taking and innovation within the field, and stigmatize innovators in the 3D printing community. That’s an outcome no one should want.